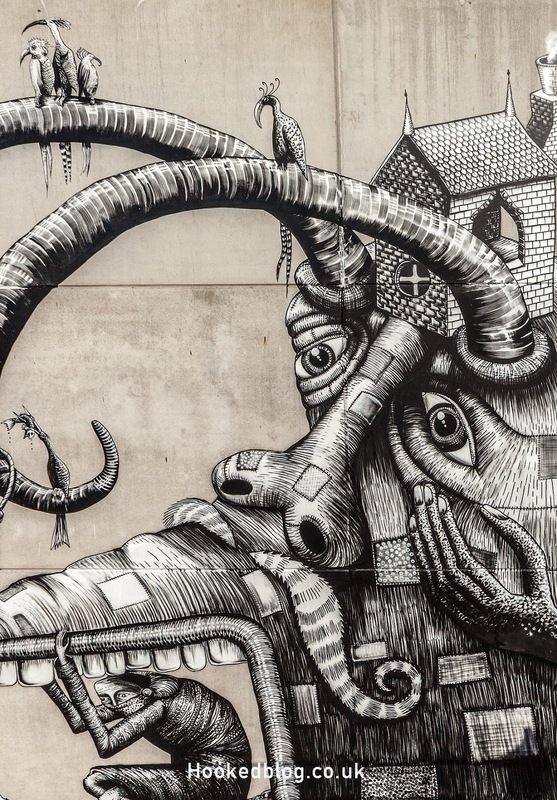 It's been some time since we caught up with UK artist Phlegm (Previously on Hookedblog). 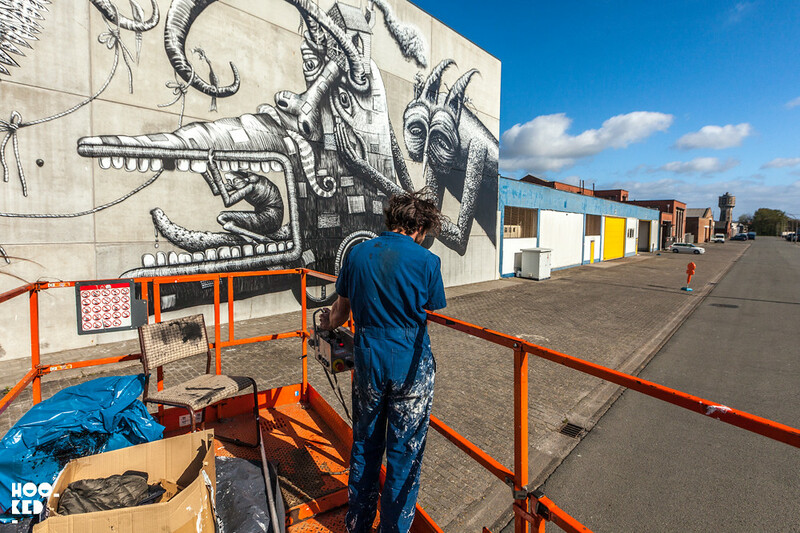 The artist was one of 20+ international artists invited to this years edition of the Crystal Ship festival in Ostend, Belgium. 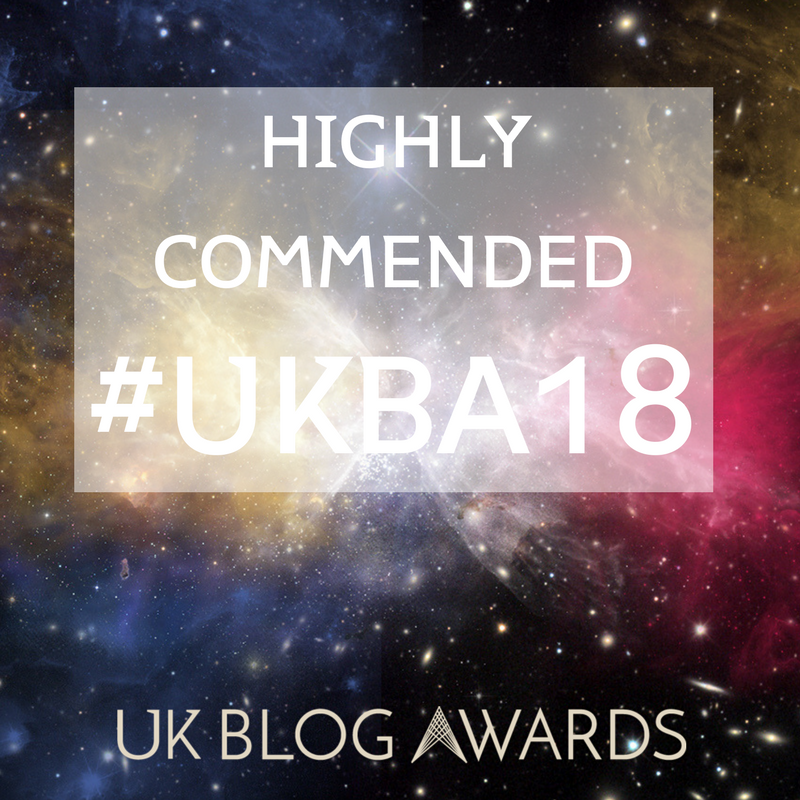 Hookedblog were in town for a number of days covering the festival and some of you may have seen some of our posts featuring the work of stencil street artists C215 and Jaune. 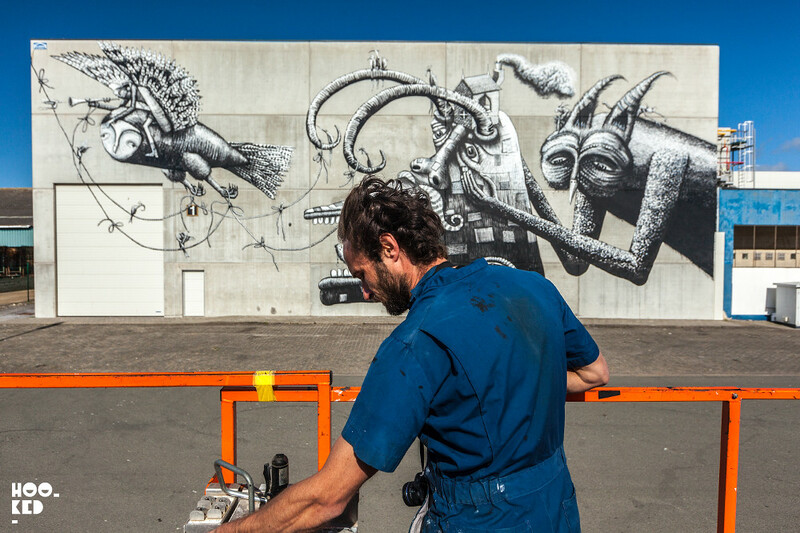 We were fortunate enough to spend some time watching Phlegm at work on this wonderful new mural, always a joy to watch the artists marking making. Located just outside the city centre across the harbour, we took the short ferry crossing from the city over to the see him at work. 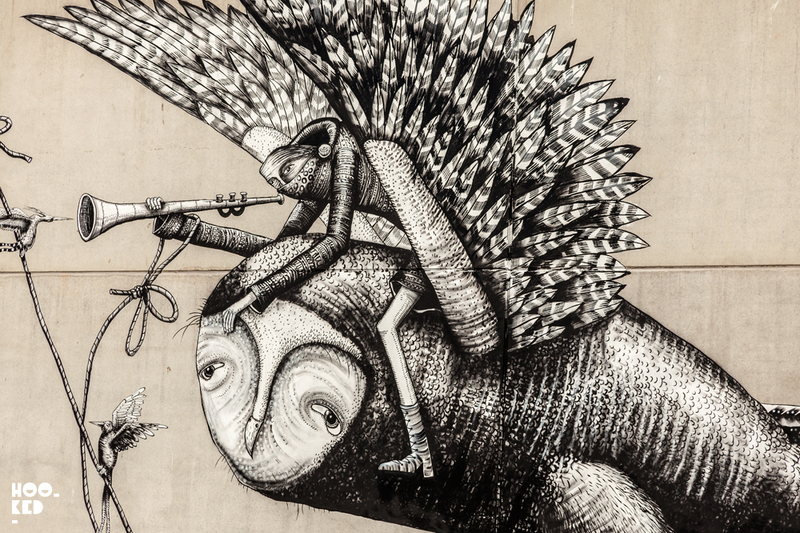 Phlegm spent four days on the large scale wall, working long days and late into the night most evenings. 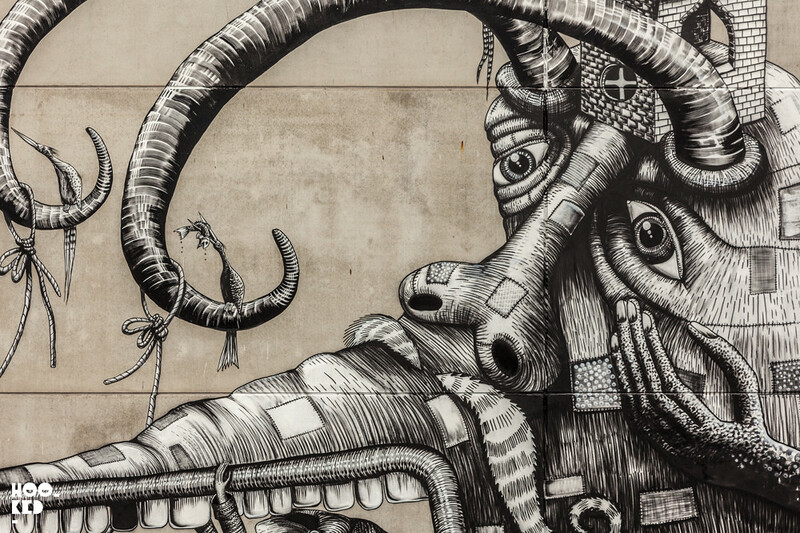 The mural features a collection of the artist's signature black and white magical creatures some of which saw him draw inspiration from the city and surroundings. 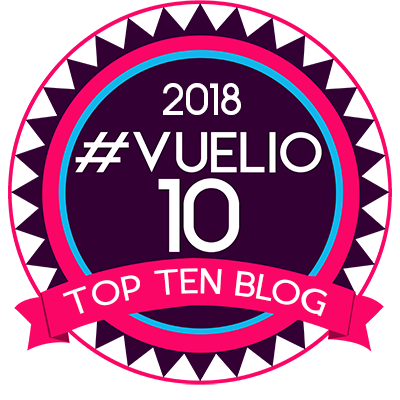 Nearby beach huts on oversized wheels, the cities many birds and seagulls all feature in the work. 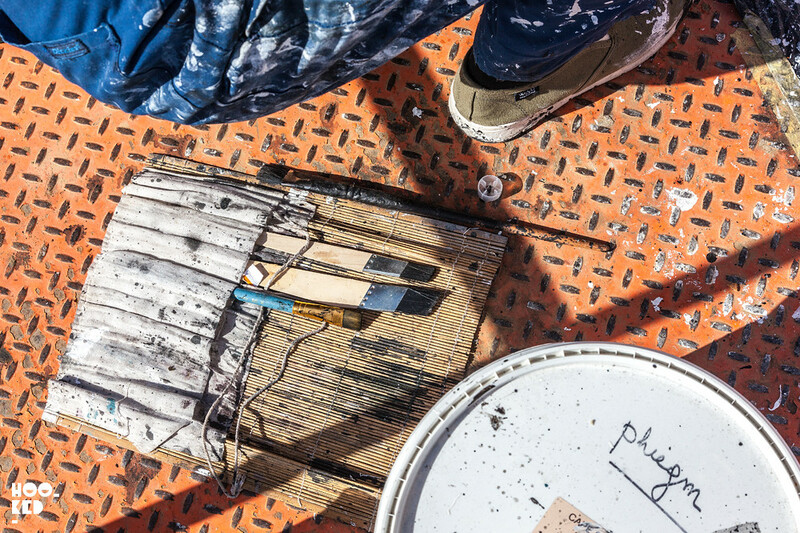 It would appear luck was on our side on this trip as our second visit across the harbour to Phlegms mural was timed just right and as we arrived the artist was moving the lift away from his finished wall. Lifts and parked cars are a nightmare for those of us documenting street art and murals!! 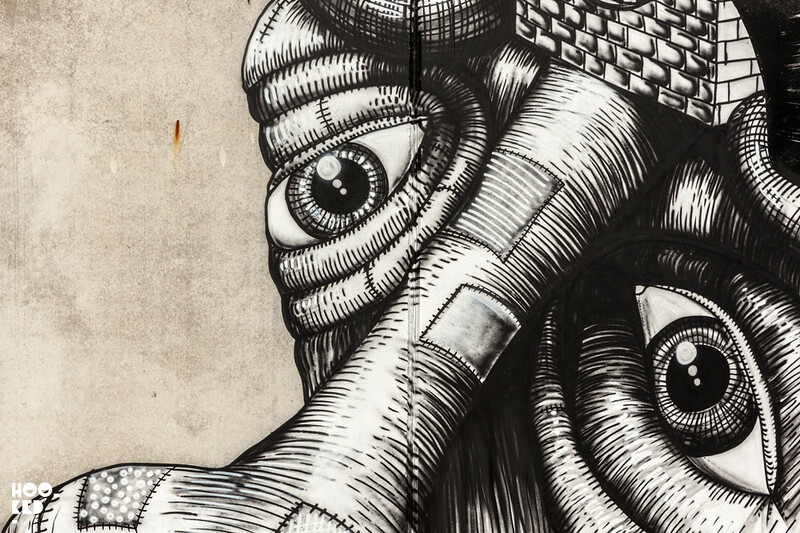 Not one afraid of heights we wasted no time jumping into the lift to capture some of the detail of the artists mark marking as well as the many mischievous creatures hiding out in the larger creatures fur. Have a look at some of the characters and details in the images below along with our photos of the completed work. 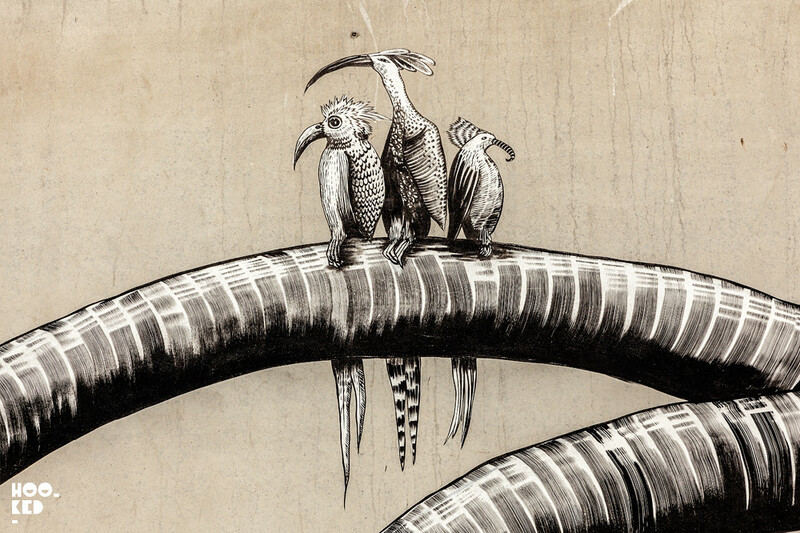 Close up detail of some of the characters hiding out in the larger character. 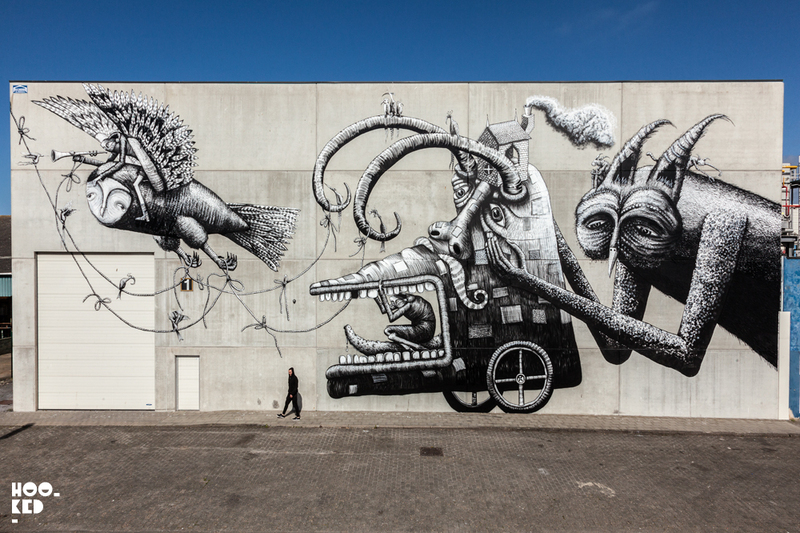 The completed mural by Phlegm in Ostend, Belgium. April 2017, with a guest star appearance from Doug of FifthWallTv for scale. 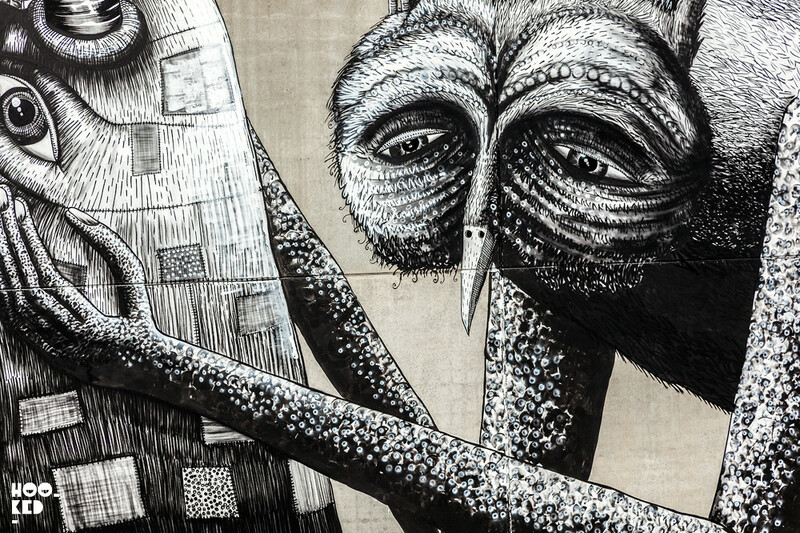 Phlegm and the Royal Opera House, London. 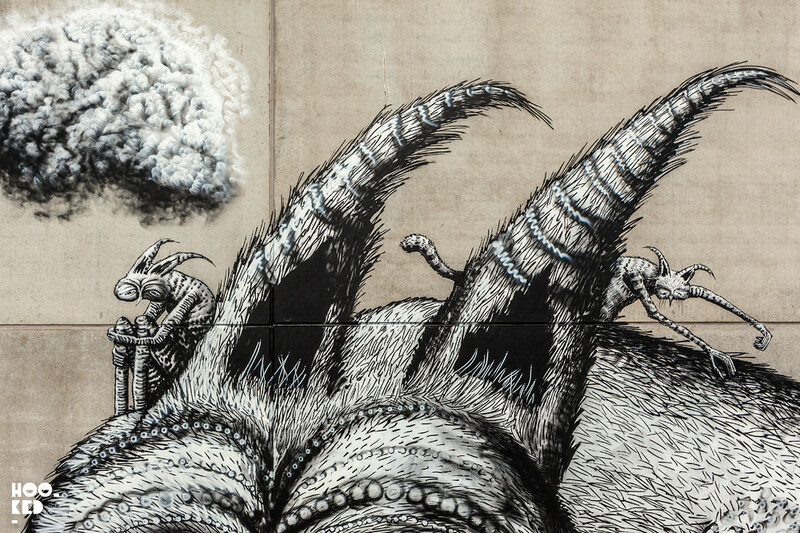 Phlegm Goes Large in London. 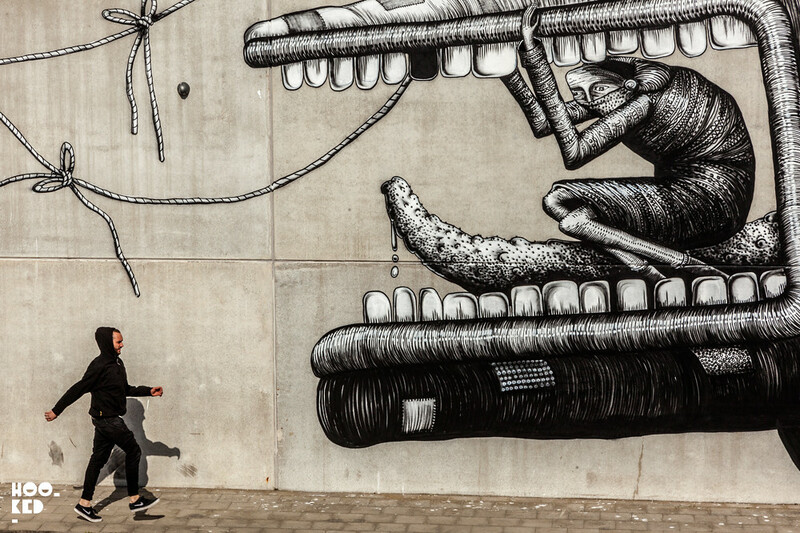 Street Artists Follow the waves of The Crystal Ship to Oostende, Belgium.